If you still haven't reached the level of guitar speed you desire, it is most likely because your approach to developing this skill has prevented you from learning to play guitar fast. Most guitarists mistakenly believe that a highly advanced level of guitar speed is possible only for those musicians with lots of natural talent or those who can practice guitar for many hours per day. The truth is that the concept of guitar speed is nothing more than a series of smaller technical skills that can be identified, taught and successfully learned by anyone. However, the most effective ways of mastering guitar speed are quite different than the methods used by the majority of guitar players. 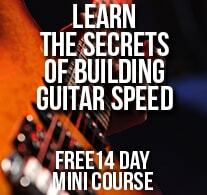 Get INSTANT FREE access to the How To Play Guitar Fast Mini Course now. Simply enter your name and email, then click the 'Give Me Access Now' button to enter. All information is kept 100% private and confidential.